For whatever reason you have, sometimes it’s handy to have a quality voice recorder in your pocket. Nowadays you can stop looking for a recorder to buy and you can use your smartphone to help you out. Many voice recorders are available for smartphone users but in order to choose the best one, you need to search among hundreds of apps. In order to save you some time, we did our research and we have for you one amazing voice recorder app you should try. Let’s discuss it. Developed for Android users, for both Android tablets and smartphones, this recording app is specially created for voice recording, offering users amazing functions and features that will allow them to experience professional and high-quality voice recordings. The user with the app is able to record sounds easily and quickly and save the voice recordings in simple MP3 formats. Quite powerful, this recorder is easy to use and the user can start recording with just a click on the app. What are the best features of Professional Voice Recorder? The Professional Voice Recorder has a quality and professional functions and features to offer which will allow users to enjoy instant and quality voice recordings without much effort. With the help of this digital and high-quality voice recorder the users also getting an amazing audio and portable recorder, and all that while enjoying the app’s easy to use and simple interface with an instant start offered. The sound recorder is allowing users to easily and quickly record sounds pause and cancel recordings and all the functions are available to be performed on a single screen and just with a click on the app. Each recording of the user depending on his choice can be deleted or saved I memory and also the user is allowed to share recordings he wants with others in real time using the functions of his smartphone or tablet. Occupying also a portable and audio recorder, the app allows recording sounds online too. 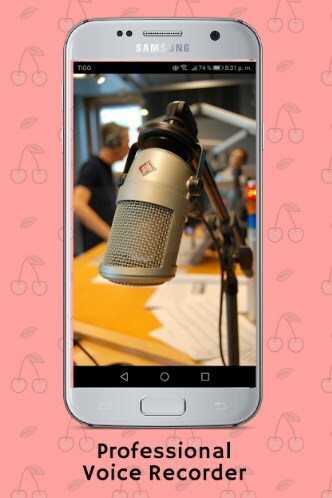 Download the app for free now on Google Play to instantly record sounds and share them in real time!